This is a fantastic classic-style train with all the modern conveniences for a unique, unforgettable experience. The train also has three saloons or living room cars, all air-conditioned and heated and with the latest technology. The train compartments have bunkbeds. There are four bunk cars, each suite with an individually heated private bathroom. This is a train made for pure travel pleasure, the immense enjoyment that comes with contemplating the beautiful landscape that passes by from large windows where you sit. The train remains in stations overnight, allowing passengers the opportunity for a good night’s sleep as well as the freedom to walk around the towns where the train stops. In addition, a bus will take you to any off route spots where the train doesn't go. Moreover, the guide will accompany you throughout the tour and show you even the remotest places of interest. Every morning breakfasts will be held on board the train, which will coincide with the train's departure. Lunch and dinners are served at previously selected local restaurants, allowing passengers the ability to immerse themselves in the regional cuisines of northern Spain. The common areas of The Robla Express (El Expreso de La Robla) are formed by comfortable lounge cars with permanent bar service. The train runs from Bilbao to Oviedo or vice versa. We combine this train trip with 2 nights in Bilbao and 1 night in Oviedo. In Bilbao, on your own, you can see the Guggenheim and enjoy Bilbao's world reknowned cuisine. You can also discover the beautiful city of Oviedo with its wonderful atmosphere and taste its famous cider. If you want, you can add a couple of nights in San Sebastian, Madrid or anywhere else that you might want to visit during this trip. During the afternoon or the next morning (depending on your time of arrival), you will visit the Guggenheim Museum (entry included in the price) and you can visit the Old Town in Bilbao and enjoy its marvelous "pinchos," a small snack, typically eaten in bars, traditional in northern Spain and especially popular in the Basque country and Navarre. Bilbao is the largest city in the Basque Country. Compared to elegant San Sebastian, Bilbao had always been considered the ugly sister. Things changed, however, when American architect Frank Gehry chose Bilbao as the home of the Guggenheim Museum, which gives Bilbao a magnificent, modern and futuristic feel. Besides the museum, there is another unmistakable thing about Bilbao, its food. Basque cuisine is the culinary mecca of Spain, with the highest concentration of Michelin-starred restaurants in the world. Baggage collection starts at 12:30 at the Concordi Station in Bilbao, a unique modernist building dating back to 1902 and one of the truest heritage sites of Bilbao from the Belle Epoque. There's free time for lunch until the reception on board the train, which takes place at 13:45. 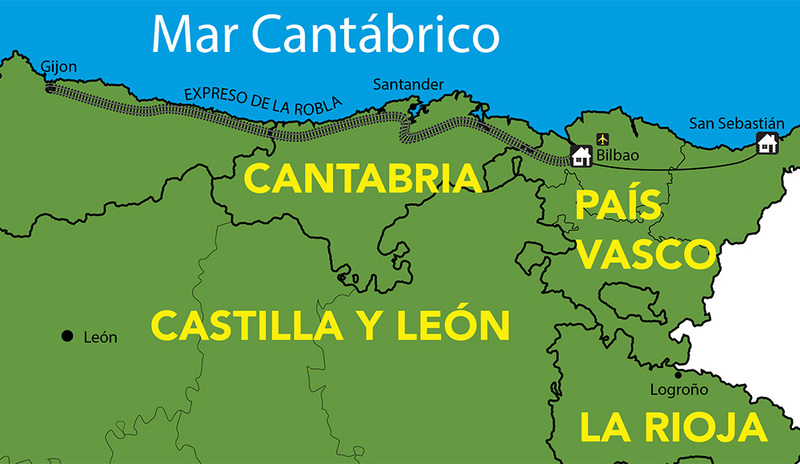 Once you're comfortable on board, The Robla Express will head to Marrón. From there, your bus will take you to Laredo, a beautiful seaside town with a rich historical and artistic heritage. Next, you will enjoy a relaxing boat ride to Santoña and visit a cannery where the traditional anchovies and northern albacore are processed. Return to the train at Gama to continue your trip to Santander, the elegant capital of Cantabria where you will enjoy your dinner and stay the night. After enjoying your first breakfast on board, you will begin the day with a panoramic tour of Santander. Count on some free time before returning to the train to go to Cabezon de la Sal. From there, your bus will take you to visit the Altamira Museum and Neocueva, and then a pedestrian tour of Santillana del Mar. After lunch, you will visit Comillas by bus for a tour of this lovely villa with its picturesque architecture. Finally, the Robla Express will be waiting to roll again to the Asturian countryside, where you will discover Llanes, a beautiful fishing village in eastern Asturias. Enjoy your visit before dinner and stay overnight in Llanes. Travel in The Robla Express to Arriondas to visit the National Park, Picos de Europa, with its lake Enol and the Sanctuary of Covadonga. There will be some free time before moving onto Cangas de Onis, where you will have lunch. Back on the train, you'll reach Nava, where you will visit the Museum of Cider and try a traditional kind of Asturian meal called an espicha at a lagar, a cider cellar, which consists of tapas, small snacks/appetizers, cider and other drinks. You will stay the night in Nava. You will begin the day by getting to know Gijon. Get a sightseeing tour of this seaside city facing the Bay of Biscay so full of cultural life. Here again you can enjoy some free time before returning to the train. Once again aboard the Robla Express, you'll roll into Oviedo. There will be a farewell to the crew and your train journey ends at the Renfe Ancho Métrico Station in Oviedo around 14:30. Unless you have chosen to extend your stay, you return to Madrid to go home. We recommend that you prolong this trip with a couple of nights stay in San Sebastian. 6x nights in double room - 3x in hotels and 3 nights on board Expreso de la Robla*. Full board on train tour (including wine and coffee - 3 dinners and 2 lunches). The price includes one Spain-is-More-Travel Guidebook (only one per group of 4). More copies can be purchased when booking for 20€ per copy, or 30€ per copy if you make the request less than 6 weeks prior to departure. Train transport from Oviedo to Madrid. Transport and entrance to scheduled visits. Programmed excursions and entry fees. Luxury coach for lokal transportation. *Beds on Expreso de la Robla are bunkbeds. Personalise your trip: Extended stays, transport from starting point from anywhere in the world and back, together with interesting and authentic experiences etc. Please ask us, we will be happy to assist you. The price includes one Spain is More Travel Guidebook per every 4 travellers. More copies can be purchased when booking for 20€/copy, or 30€/copy if you make the request less than 6 weeks prior to departure.